You’ve seen all this before just obviously not in this combo! Cue wooly skirt and hand-me-down pink top from my aunt to accompany me on my first day back teaching high school. Must remember everything I just taught my teacher training crew last month. I really chose these clothes today because I wanted to wear my spotty tights. 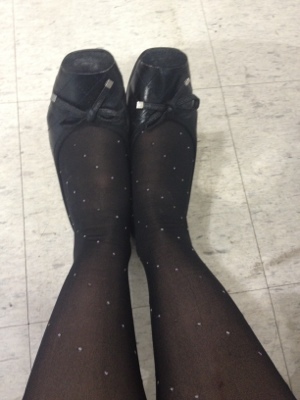 I did wonder, however, if it looked like I had simply walked through a cotton wool factory … This don’t have quite the wow factor of my Leona Edminston spotty tights. Posted in Cue, fashion, hand-me-down, work and tagged high school, winter. Bookmark the permalink.